Can “A Separation” bring Unity? As some of you know I am not a TV watcher, so I only found out the good news about A Separation winning the Oscar for best foreign film, through the congratulatory texts and emails sent by friends. Soon, Facebook was flooded with comments and photos. What’s the big deal? I thought. He’s had better movies. When I finally sat down and watched his acceptance speech, I couldn’t hold back my tears. Not because of the movie. 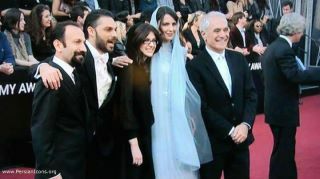 But because through that event the world could see something other than a darkly portrayed Iran. That’s what all your Iranian Facebook friends, who seem to inundate the pages with clips, are trying to do. It’s to show you, in Dr. Naderi’s words: “Iran’s name on display for the right reasons. “ To say, there’s more to us than a grumpy government. We are so weary of hearing only talks of nuclear power and terrorism. And would love nothing more but to show you a bit of our culture and heritage. That way you can have a more complete picture. In case you missed Farhadi’s acceptance speech, in his charming accent, he said: people of Iran are happy not because of a movie or award but because “At the time when talk of war, intimidation and aggression is exchanged between politicians, the name of their country is spoken here through her glorious culture, rich and ancient, that’s been hidden under the heavy dust of politics.” He dedicates the award to “the people who respect all cultures and civilizations and despise hostility and resentment.” The last part caused that emotional stir in me. I know the media paints only pictures of hatred, but anytime I’ve been to Iran, I’ve seen nothing but friendly people, fascinated by the world outside of their country. Intelligent folks who have a strong sense of music, literature, arts and sciences (even politics) and are always ready to entertain a great conversation. Through art, we look at each other as humans irrespective of the relationship between our governments, or even the behavior of those governments. We share our daily life challenges with others and open channels for communication. I once heard Elif Shafak, a Turkish writer say this: An Israeli reader will read the work of a Palestinian writer and vice versa even if they may not speak to each other face to face. Some skeptics may see the movie’s recognition as a political move. You mean using art to stop conflicts? What could be better? Let’s do more. Certainly the reaction of Iran’s government to Farhadi’s success remains to be seen. You just never know. Before I end this entry, may I recommend one of my favorite movies by Farhadi: “About Elly.” When you come across movies or any other piece of art made in Iran, keep in mind that filmmakers, writers, painters, and photographers have very few topics to work with. Their works are subject to scrutiny and censorship by the government. Look at their works through that lens and you’ll appreciate how artfully they use the subtlest nuances to create wonderful pieces. Congratulations to Mr. Farhadi and all artists who make a difference in the world through their creativity and creations.